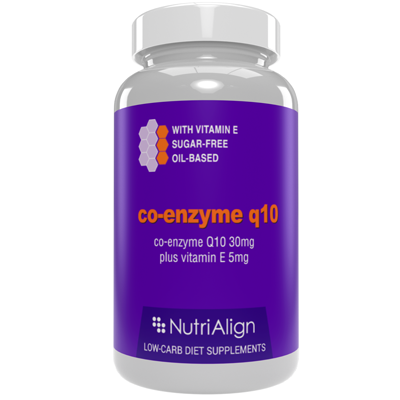 Nutri-Align Co-Enzyme Q10 comes in a small, easy to swallow softgel capsule. Vegetable oil acts as base for better absorption. Unlike cheaper CoQ10 supplements, our product includes Vitamin E (5mg) to stabilise the oils and prevent rancidity. On a low-carb diet, your body switches to burning fat for fuel, instead of glucose. It’s a major change for your system. If your metabolic resistance is high, it could take a while to switch. You may suffer the infamous low-carb flu before you break into ketosis. Many low-carb dieters take co-enzyme Q10 for faster transition to ketosis, and more efficient fat metabolism throughout their diet. Dr Atkins recommended CoQ10, together with L-Carnitine and chromium, to speed up ketosis and kick-start fat-burning metabolism. Read more about Dr Atkins recommendations in his original book. Beeswax, gelatin, glycerin, purified water, caramel, brilliant blue, allura red, titanium dioxide. Contains an ingredient derived from fish. The dosages listed below are guidelines only. Ideally, consult your GP or a registered dietitian to get advice on optimum supplementation for your lifestyle. Nutri-Align supplements are manufactured and packaged in the UK. All supplements pots are double-sealed for your protection. We are confident that Nutri-Align Multivit will make your low-carb diet easier. We recommend that you take the supplement as directed for at least 7 days, in order to feel the benefits. But if you feel that the product is not working for you, or are unhappy for any other reason, please return it to us for a full refund – whether opened or unopened. We will take your word for it and will issue a refund immediately on first request. Alam, M. and Rahman, M. (2014). Mitochondrial dysfunction in obesity: potential benefit and mechanism of Co-enzyme Q10 supplementation in metabolic syndrome. Journal of Diabetes & Metabolic Disorders, 13(1), p.60. Grenier-Larouche, T., Galinier, A., Casteilla, L., Carpentier, A. and Tchernof, A. (2015). Omental Adipocyte Hypertrophy relates to Coenzyme Q10 Redox State and Lipid Peroxidation in Obese Women. J. Lipid Res., p.jlr.P058578. Our products are aimed at people who are healthy overall and follow a low-carb diet to lose weight. If you are pregnant, breastfeeding, taking prescription medication or are under medical supervision, consult your doctor before taking any supplements.